I adapted another recipe to make it suitable for the slow cooker. This is also fab using mutton, but if you can get goat it is so worth it. I've found a supplier locally who does it (Madina General Store, Hatfield Road, St Albans) - what a find! I only went in for some scotch bonnets and curry leaves! (Wasn't able to source scotch bonnets or fresh curry leaves from either Morrisons or Sainsburys locally)?? Pre-heat the slow cooker to low. Blend the onion, garlic and ginger in a food processor to form a paste. Heat the oil in a frying pan and add the onion paste, frying for a couple of minutes. Add the chillies, curry leaves, curry powder and meat and stir until browned. Pour mixture into the slow cooker, add the tomatoes, stock and beans and stir. Cook for 6-8 hours until the meat is moist and tender. Add the lemon juice and coriander and serve with roti breads (if you can source them), or rice or salad of your choice. 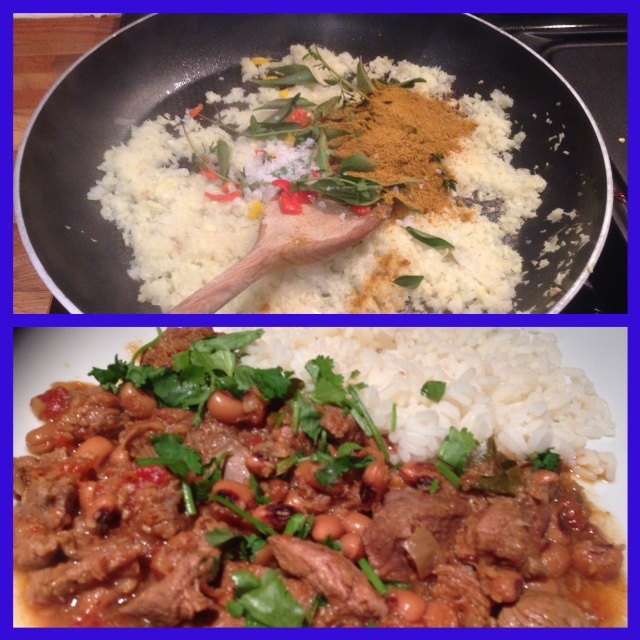 Simply delicious, and Chris said it was my best curry ever! Fine accolade indeed. "Hiya !!! ... I am Sonam Raees A Hot, adorable and hot young lady, as individuals depict me in their fantasies. Conceived and raised in an exceptionally pleasant family where you wont discover individuals other than specialists and architects from a north town of India. I have dependably been an extremely unusual in all viewpoints where my everything relatives have been exceptionally bashful and sensible individuals. It is truly extreme for me to gel with a family people whose nature is all together not quite the same as what I am really conveying. I am as beguiling as any lovely hollywood superstar so why ought not I appreciate my magnificence then being in books and writing. Notwithstanding all these, I went by Goa for my further designing studies and I really got wings to my fantasy of getting to be motivated dream model of everybody's eye. In any case, four years how might I really inspire enough to have a ton of fun and celebrate. Out of the blue one of my old town companion rang who was additionally concentrating on in a similar city, for a gathering. I was extremely glad as though I was meeting my old companion and celebrating with part numerous young men. I was stunned to see her spending extravagantly and I asked her, ""darlings give me an approach to profit the way you do it being an understudy"". She uncovered a mystery of she working in Goa Call Girls and Goa Escorts Service. This was something new to me however this resembled with one slug two shots. As I am hot I would appreciate messing around with men and young men and where I would profit to commend all the days like VIP in Goa. Be that as it may, even now I needed to reevaluate on my choice so I asked my companion that I should buzz you back. It is a good blog.